At 200 am PDT/0900 UTC the center of Tropical Depression Manuel was located near latitude 23.2 north/longitude 107.8 west, about 145km/90mi W of Mazatlan,Mexico and about 215km/135mi E of Cabo San Lucas, Mexico with maximum sustained winds of 55 km/h - 35mph. Manuel is moving toward the northwest near 7 km/h. A decrease in forward speed is expected today followed by a turn toward the west-northwest and a further decrease in forward speed tonight and Thursday. On the forecast track the center of Manuel is expected to remain offshore of the west-central coast of Mainland Mexico today. 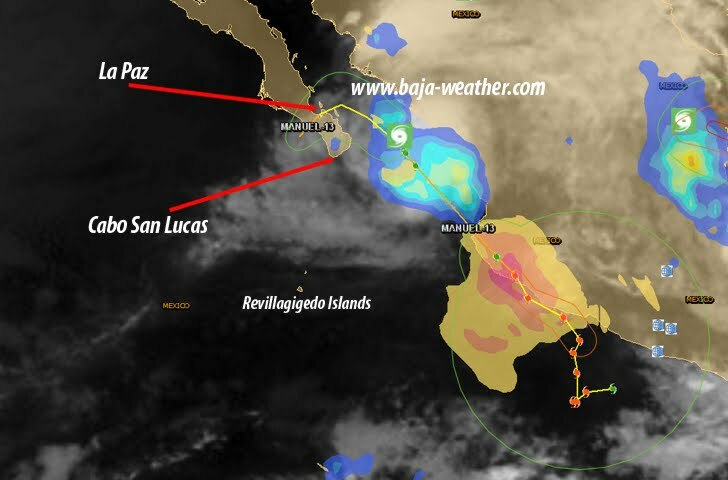 Approach of the East Coast of the Baja California peninsula in the tropical storm watch area late Thursday and Thursday night.